STORM BRING THE RAIN DOWN ON MANLY WIN 40-12. The Melbourne Storm have drawn first blood in the 2009 NRL Finals Series with a dominant 40-12 win over the Manly-Warringah Sea Eagles at Etihad Stadium last night. Melbourne's Billy Slater scored FOUR tries in a runaway Man of the Match performance, as the Storm's big four of Slater, Cameron Smith, Greg Inglis and Cooper Cronk stood head and shoulders above their opposition. The NRL Finals Tweet was on hand to catch all the action that was worthy of a tweet and it has been compiled below in chronological order. For future reference - the front page of this website will automatically feed the Twitter Updates onto the right side of the website - so if you don't have Twitter you can follow the notes there. 40 defeated 12 As it happened - Storm 40 def. Sea Eagles 12. 34. NRL Finals Scouting Reports: Cooper Cronk & Matt Orford scouted for their clash tonight: CLICK HERE - about 5 hours ago from web 33. Jeff Lima is playing for Melbourne. Jamie Lyon also in for Manly. Storm won NYC 54-18 over Souths. - about 4 hours ago from mobile web 32. Adam Cuthbertson also a late starter. Sticking with the Sea Eagles 22-16, David Williams first tryscorer. - about 4 hours ago from mobile web 31. Early mistake by Watmough opens door for Storm early, Hoffman and Inglis combine to put Slater over. MEL 4-0. - about 4 hours ago from mobile web 30. Kite KO'd early should be back. Orford's first attacking cross kick easily defused. Still MEL 4-0 after 14mins. - about 3 hours ago from mobile web 29. Steve Matai grubbering for himself on 3rd tackle isn't in the Manly playbook I'm sure. - about 3 hours ago from mobile web 28. Wow what a soft penalty on B Stewart... Referees on the field? Yep they just made sure you knew they were. - about 3 hours ago from mobile web 27. Great pass from Finch and take from Nielsen for a try in left corner. Smith will try and convert from touch. MEL 8-0. - about 3 hours ago from mobile web 26. Ryan Hoffman best on field so far. Cameron Smith converts beautifully. MEL 10-0. - about 3 hours ago from mobile web 25. Phil Gould 100% right, Matt Orford non-factor so far. Tandy and Lima doing great job off bench. Foran on for Lyon. - about 3 hours ago from mobile web 24. Slater makes a mockery of my decision to drop him for B Stewart in my Fox Sports Fantasy team. Scores 2nd try easily. MEL 16-0 after 37 mins. - about 3 hours ago from mobile web 23. Field Goal anyone? Melbourne could do worse before halftime. - about 3 hours ago from mobile web 22. QF1 Halftime score: Storm 16 lead Sea Eagles 0. Best: Hoffman, Slater, Smith. Worst: Orford, Watmough. Manly gone? - about 3 hours ago from mobile web 21. The crowd is all about Billy Slater tonight. Plenty of oooooohhhhs and aaaahhhhs when he gets the ball. - about 3 hours ago from mobile web 20. Adam Blair butchers a try... No no no no no! Slater gets his 3rd and that's the game! - about 3 hours ago from mobile web 19. Cameron Smith grubbers through and Mr No Longer In My Fantasy Team rubs it in for a 22-0 Storm lead. - about 3 hours ago from mobile web 18. The question now becomes this: do Manly deserve another chance after this performance? - about 3 hours ago from mobile web 17. Brett Stewart pulls off an amazing tackle to stop Slater who beat him 25m earlier. Watmough is a turnstile, always will be. - about 3 hours ago from mobile web 16. Cameron Smith barges over from dummy half after Inglis takes a gift intercept from Orford. Blowout coming and revenge for the GF scoreline? - about 2 hours ago from mobile web 15. Melbourne making it look easy. 28-0 after 52 minutes. - about 2 hours ago from mobile web 14. Anthony Watmough isn't to blame for anything ever apparently... and he's been a total non factor with the ball. - about 2 hours ago from mobile web 13. Aiden Tolman runs off a great face ball from Cameron Smith to score under the posts. 40 looming as a real possibility. MEL 34-0 after 61mins. - about 2 hours ago from mobile web 12. Steve Matai finally gets Manly on the board after a glut of possession and a nice Brett Stewart pass. MEL 34-6 with 10 to go. - about 2 hours ago from mobile web 11. Brett Stewart and Brent Kite only positives for Manly... Oh and Foran just scored for Manly. - about 2 hours ago from mobile web 10. Matai to Cuthbertson into gap and Foran finishes it. Orford converts. MEL 34-12. - about 2 hours ago from mobile web 9. Manly wake up with 15 to go... That'll infuriate Des Hasler that they had it in them. - about 2 hours ago from mobile web 8. Slater slices through again to score his 4th try. Can he match clubmate Dane Chisolm's 5 earlier in Toyota Cup? - about 2 hours ago from mobile web 7. Steve Turner converts Slater's try. MEL 40-12 in front of just over 21,000 at Etihad. - about 2 hours ago from mobile web 6. It's all over and Melbourne totally deserved their 28 point victory. Slater dominant in 40-12 win. - about 2 hours ago from mobile web 5. Still hurting from the decision to drop Slater for Brett Stewart in my Fox Sports Fantasy team... inconceivable! - about 2 hours ago from web 4. Melbourne Storm 40 (B Slater 4, D Nielsen, C Smith, A Tolman; Smith 5/6, S Turner 1/1) d. Manly Sea Eagles 12 (S Matai, K Foran; Orford 2/2) - about 2 hours ago from web 3. QF1 Best - Melbourne: B Slater, R Hoffman, C Smith, G Inglis, B Finch, J Lima, R Tandy, A Tolman, C Cronk. Manly: B Stewart, B Kite. - about 2 hours ago from web 2. Melbourne had every elite player play superbly tonight (Slater, Inglis, Smith & Cronk) & got great go-forward. Contenders again... oh yes! - about 2 hours ago from web 1. Manly had just two key players put in (B Stewart & Kite - who got KO'd early) and a host of passengers (esp Orford & Watmough). Nervous wait ahead. 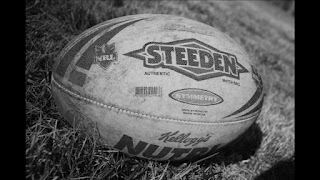 - about 2 hours ago from web ===================================================================== Final Score 1st Qualifying Final 2009 MELBOURNE STORM 40 Tries: B Slater 4, D Nielsen, C Smith, A Tolman. Goals: C Smith 5/6, S Turner 1/1. Defeated MANLY-WARRINGAH SEA EAGLES 12 Tries: S Matai, K Foran. Goals: M Orford 2/2. @ Etihad Stadium, Melbourne. Friday 11 September 2009. Official Man of the Match: Billy Slater, Storm. NSC Man of the Match: Billy Slater, Storm. Glenn Lazarus Player of the Finals Points: 5 - Billy Slater, Storm. 2 - Ryan Hoffman, Storm. 1 - Cameron Smith, Storm. Game Rating: 3 out of 5. One Line Game Review: Slater sends strong message he's not giving up on the Storm's season yet, bagging four tries as all the Storm's big guns fire in 40-12 rout of defending Premiers. ===================================================================== What the result means? Melbourne are guaranteed a spot in at least next week's elimination finals, while Manly must rely on at least two of the top 3 seeds winning their Finals to remain in the competition. Below is the Qualifying Finals Review & first look at the Elimination Finals Matchups Video.